The Excavator hard at work! Taking Old to Convert to New!" 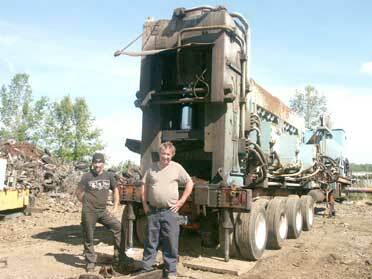 The Machine Behind Tom and Bill is a 500 ton Lollini Shear/Baler/Logger. 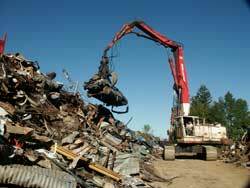 It will radically change the way we receive, grade, purchase, process and ship ferrous and non ferrous scrap. It has the ability to shear 24" I-beam, to make industrial bundles and to make a car into a brick the size of a deep freeze. It is mobile, so it will be used at our facility in Sebringville, in Goderich and portentially on job sites. 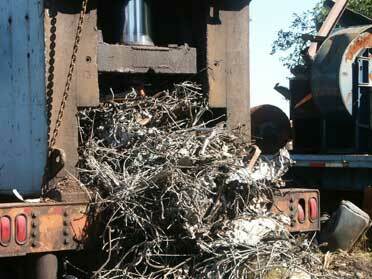 It is the only machine of this type in our region. 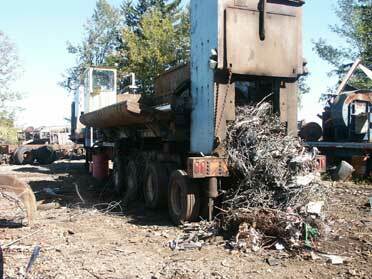 For Scrap processing in Perth and Huron Counties, It is a Game Changer!